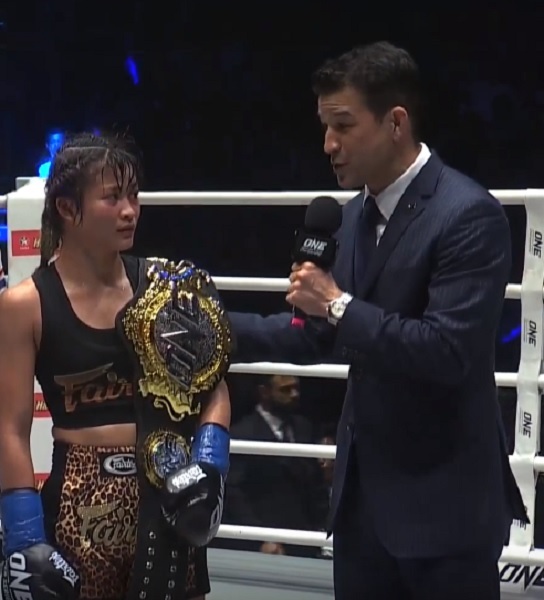 Representing Pattaya, Thailand, Stamp Fairtex, 20, was crowned the new ONE Super Series Kickboxing Atomweight World Champion. As the challenger, she dethroned defending champion Kai Ting “Killer Bee” Chuang, 23, of Chinese Taipei in the co-main event of “ONE: Kingdom of Heroes” at the Impact Arena in Bangkok, Thailand on October 6, 2018. After five five-minute rounds, the kickboxing atomweight bout between Stamp and Chuang was left in the hands of the judges. In the end, referee Atsushi Onari raised the hand of the Thai challenger as the winner via unanimous decision. Originally from Rayong Province, Thailand, Stamp is the first ever female Thai athlete to be sponsored at Fairtex Training Center in Pattaya. She was the second female Nak Muay to take part in the the striking-only league of ONE Championship. Stamp was born to a family of fruit farmers. While several of her family members practiced Muay Thai, she focused first on her farming duties and education before getting into martial arts. “ONE: Kingdom of Heroes” marked Stamp’s ONE Super Series debut and kickboxing debut. She has a professional Muay Thai record of 60 wins, 15 losses and 5 draws. Losing to Stamp at “ONE: Kingdom of Heroes” downgraded Chuang’s professional record to 17 wins and 6 losses. She is training out of Iron Boxing Gym in Nantun, Taichung, Taiwan. In the main event of “ONE: Kingdom of Heroes,” reigning World Boxing Council Super Flyweight World Champion Srisaket Sor Rungvisai, 31, of Sisaket, Thailand and his challenger Iran “MagnifiKO” Diaz, 28, of Ciudad Obregon, Sonora, Mexico competed in 12 rounds of boxing. The Thai defending champion retained his title by winning via unanimous decision.